Bhadrakali Temple in Warangal is around 4 km from the famous thousand pillar temple. Bhadrakali Temple is located in Hanamkonda and the diety worshiped is goddess "Bhadrakali". 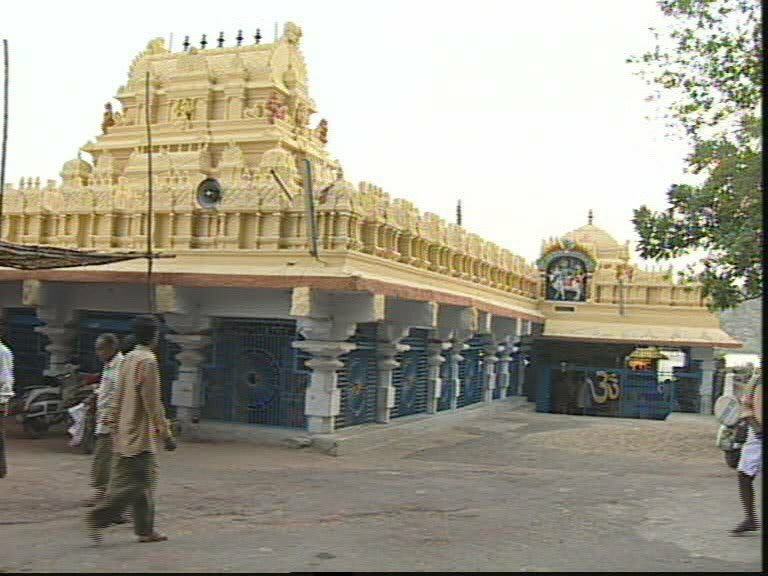 This temple is located on the top of the Hill in hanamkonda. The Goddess Bhadrakali is refered popularly as "Grant Mother Goddess" by the devotees and they highly esteem the goddess. The image of the goddess is made out of square shaped stone of 2.7 X 2.7 meters in a sitting posture with a fierce looking eyes and face. The statue is seen wearing a crown and has eight hands with various weapons in her hands. Goddess Bhadrakali is worshipped by the devotees as their main deity in the Telangana region of Andhra Pradesh. Goddess Bhadrakali is the ferocious form is known as Goddess Shakti. Bhadrakali is the consort of Lord Veerabhadreshwara Swamy. Also in this temple Ammavaru is a Shakti Peetha which is dedicated to Mother Goddess. Bhadrakali Ammavaru or the Deity of Kakatiya Dynasty which means that Bhadrakali Ammavaru is worshipped as Kakathamma which represents the deity of Kakatiya dynasty. You can find all details about Bhadrakali Mata which was scriptured in the Siddeshwara Charithramu and Pratapa Rudreeyam. It is said that Pulakesi II has built this temple in the year 625 AD to commemorate his victory over Vengi Chalukyas the West Chalukya King. The major attraction at the Bhadrakali Temple in warangal is that it is located on the bed of picturesque Bhadrakali Lake. This is an artificial lake which is of 2 and half kilometers radius. There are a number of natural formation of the rocks surrounding the temple in the lake and also adding charm to the temple and these rock formations are the most dominant in the temple. It is also known from the devotees that there are some unique rocks with some special shape which is said to carry some spiritual powers. To add to the awe of a person the temple is 250 year old and is said that the temple is built by Pulakesi-II. Even though one looks at the image of the goddess as Bhadrakali it is said that the goddess is transformed by the chanting of mantras in to a rare form called Tripura Sundari which means Beauty of the Three worlds or meant to be cities and one can predict the three cities as Kazipet, Hanamkonda and Warangal. The boating in the lake is thrilling and most of the times devotees come her for spending leisure time apart from the visit to the temple. There are a number of provisions made for the visitors at the temple premises. One has to pay a fee to use the boats in the lake. Usually most of the time you would find young people at the lake because of its close proximity to colleges. If you want to visit the famous Bhadrakali Temple in Warangal then it is the Telugu month of 'Sravana' which is in the month of August and September according to the Gregorian Calendar. During this time a festival is organized by the temple where the deity or goddess Bhadrakali is decorated in different forms. The place is having around 8 major and 12 minor temples surrounding the mountains of Bhadrakali Temple which gives a sacred aura when there is a large gathering of devotees gather to offer prayers and specially during festival times. 4. Maghi Utsavalu or Magha Navratri in Magha masam. During the Chaitra masam Bhadrakali Brahmotsavalu is also held where in large number of devotees gather to offer their prayers.